3 vols. Illus. throughout from original drawings, paintings and other illustrations done to illustrate ERB stories. 12x8¾, linen with gilt leather cover title labels, color pictorial cover labels, spines lettered in gilt, slipcase. No. 1102 of 2000 copies. Marvelous compilation of illustrations for stories and books by Edgar Rice Burroughs, many in color, some fold-out, reproduced from the original artwork in the Burroughs archives and other collections, many in private hands. Accompanied by Ed Gilbert's personal file on this production, including a T.L.s. from Hulbert Burroughs "Dear Ed: We have been cooperating with Russ Cochran on these books and thought you might be interested in knowing about the project"; 13 copies of the prospectus; form letters from Cochran to collectors; catalogues for Cochran's comic art auctions; newsletters and other material. A little rubbing to the gilt at the spine feet, else fine. Two-tone cloth, spine lettered in gilt, jacket. First Edition. The notable science fiction writer turns to serious biography, and traces Tarzan back to his antecedents including Sherlock Holmes and other historical figures. Foreword by Hulbert Burroughs. With illustrations of dust jacket, etc. 10x6½, red cloth, spine lettered in gilt, jacket. Complete Edition, Revised. Inscribed and signed by Hulbert Burroughs on the front free endpaper "To Ed Gilbert, the master collector of Ed's autographed books, Sincerely, Hully Burroughs, Tarzana, 11-25-64." Although minor faults and innaccuracies in the Heins bibliography have been pointed out over the years, it still remains the great work in the field, and the model upon which the arrangement of this present catalogue is based. Fine in near fine jacket. Six volumes on illustrators and illustration Includes: The Fantastic Art of Frank Frazetta. . * Frank Frazetta Book Two. . * Frank Frazetta Book Three. . * The Fantastic Art of Boris: Boris Vallejo. . * Richardson, Darrell C. J. Allen St. John: An Illustrated Bibliography. 1 of 2000. . * James Van Hise Presents Edgar Rice Burroughs' Fantastic Worlds. . Together, 6 vols. Illus., some color. 11x8½, color pictorial wrappers. Some of the finest of fantasy art. Very good to fine condition. by Richard A. Lupoff ~ Canaveral 1965 Preface by Henry Hardy Heins. Illus. from original illustrations and artwork. Pebbled cloth, spine lettered in gilt, jacket. No. 129 of 150 copies. First Edition. Signed by Lupoff on the limitation-page/front pastedown. Pioneering study of ERB's literary output, rescuing him from the pulp fiction genre and placing him within the mainstream of the most influential 20th centuy American authors. Fine condition. 32 pp. Orange wrappers with illustration on front cover by John Coleman Burroughs, original mailing envelope (unused). First Edition. Long overlooked, this interesting guide for youthful members of the Tarzan Clans (join for $1.00, get this guide, a membership card, and a signed Burroughs first edition) is now acknowledged as the work of ERB. Heins T24.1; Zeuschner 679. Fine in fine, unaddressed envelope. The Blue Book Magazine 6 issues, Vol. 61, No. 6 (October, 1936), Vol. 62, Nos. 1-5 (Nov. 1935-March, 1936). Illus. by Frank Hoban. 10x6¾, original color pictorial wrappes, the first featuring Tarzan. First Appearance. 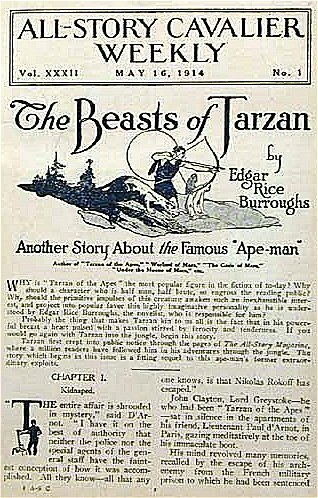 First publication of the Tarzan story which was issued in book form as "Tarzan's Quest." Marks the final appearance of Jane as a major character in the Tarzan series Heins T22; Zeuschner 793. Some normal wear to the wrappers; usual darkeing to contents, a few pages torn, else very good. Frontispiece by Frank Frazetta; interior illustrations by Roger B. Morrison. 10x6¾, pictorial wrappers. First Edition. First book publication of this story which first appeared in four issues of Argosy All-Story Weekly, October 8, 15, 22, and 29, 1921. The "realistic" story, in which an excellent athlete is determined to become a successful businessman also, is based upon Burroughs' actual experiences in 1911 when he wrote and tried to sell booklets on expert salesmanship and how to run a business. He was, of course, unsuccessful in his business endeavors, and literature is richer for it. (Heins X2); Zeuschner 116. Fine. The Girl from Farris's ~ House of Greystoke Frontispiece by Franz Frazetta. 10x6¾, pictorial wrappers. Second Edition. First "Authorized" book publication of this sociologically-interesting early work by Burroughs, first published in four issues of All-Story Weekly in 1916. In 1959 there was a little (4x3") limited edition published in Tacoma, Washington, but as Heins says, that publication was "hardly deserving of attention... It is a typewritten copy of The Girl from Farris's, reduced in size and printed by photo-offset. It can hardly be read without a magnifying glass, and the glass discloses such a profusion of misspellings and other typographical errors that this reader gave up in disgust after the first three or four pages." He points to the planned publication by the House of Greystoke as being worth the wait. Zeuschner calls this "an attractive edition." (Heins X1); Zeuschner 160. Fine condition. Original appearance of the story in All-Story Cavalier Weekly, with the pertinent portions from the five issues bound together, along with other stories from the magazine, without the wrappers. 9½x6½, cloth with leather corners (previously leather-backed, now rebacked with cloth). The first appearance, as published in All-Story Cavalier Weekly, May 16, 23 & 30, and June 6 & 13, 1914. Burroughs had to add to the story for its book publication, as the length was found wanting. Heins p.44; Zeuschner 40. Some darkening to the paper, large rubberstamp of Popular Circulating Library of Sacramento, California, to the front free endpaper, very good. Editions by Robert B. Zeuschner ~ McFarland & Co. ~ 1996 Gilt-lettered cloth, jacket. No. 4 of 300 copies of the special autographed edition. First Edition, First Printing. With signed presentation inscription by Zeuschner on the front free endpaper, "This book for Edward Gilbert, a Burroughs fan and collector since 1925, a gentleman who I am proud to know. 12-12-96 Bob Zeuschner." Signed by Zeuschner on the limitation-label affixed to the front pastedown. Signed by the dedicatee Lindy Zeuschner on the dedication-page. Signed by Danton Burroughs on the acknowledgement-page. Rubber stamped signature of Edgar Rice Burroughs on that page as well. Although lacking the elegant method of presentation found in Heins' 1964 bibliography, Zeuschner's work contains much additional information, and corrects many errors, a worthy contribution to the bibliographical study of ERB. Fine in fine jacket.